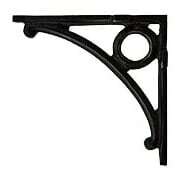 Cast iron Romanesque bracket in antique white finish. This bracket is 8 1/8" tall by 12" long and 13/16" wide. 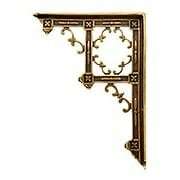 Brass Gothic-Style Shelf Bracket in Antique-By-Hand - 9 1/4" x 6 3/4"
This distinctive Victorian-style bracket is a House of Antique Hardware exclusive! Reproduced from an 1880s Gothic-Revival design, it has a wonderful architectural quality, recalling the bracketed wood ceilings of medieval churches. It’s made of solid brass to provide sturdy support for shelves throughout your home. Our exclusive Antique-By-Hand finish ages gracefully over time into a beautiful natural patina. Victorian Gothic Cast Iron Shelf Bracket - 9 1/4 x 6 3/4"
This distinctive Victorian style bracket is a House of Antique Hardware exclusive! Reproduced from an 1880s Gothic Revival design, it has a wonderful architectural quality, recalling the bracketed wood ceilings of medieval churches. 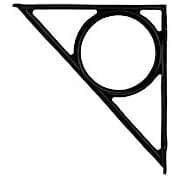 Made of heavy duty cast iron to provide sturdy support for shelves throughout your home. Choose from three finishes: matte black, antique white and lacquered antique iron. Brass Gothic-Style Shelf Bracket - 9 1/4" x 6 3/4"
This distinctive Victorian-style bracket is a House of Antique Hardware exclusive! Reproduced from an 1880s Gothic-Revival design, it has a wonderful architectural quality, recalling the bracketed wood ceilings of medieval churches. It’s made of solid brass to provide sturdy support for shelves throughout your home. Choose from a polished brass or oil-rubbed bronze finish. 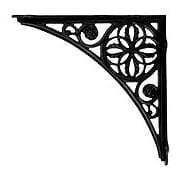 Large Rosette Design Iron Shelf Bracket - 15 1/2" x 15 1/2"
Our large, heavy-duty bracket is ideal for supporting kitchen or bar counters, as well as deep shelves for dishes, cookware and video equipment. The lovely Victorian design features a prominent rosette, reminiscent of a Gothic stained glass window. Solidly crafted from cast iron with a durable matte black powdercoat. 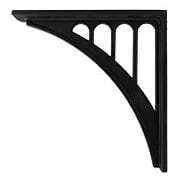 Our Bridge-Style Shelf Bracket is inspired by the catenary arch design of the early 20th century, Columbia-Wrightsville Bridge in Pennsylvania. A simple design gives this minimal bracket a versatile quality, making it ideal for just about any room. Made of sturdy cast aluminum, a set can support up to 400 lbs. Due to the potential for carrying substantial loads, professional installation with blocking and sturdy fasteners is recommended.